Sew delicious! Sew cute and clever! This cookie and cookie packaging idea couldn’t be more ideal for mom’s, grandma’s and all of us that are dusting off our sewing machines with the onset of crafting popularity and the love for making things by hand. Get those crafty hands busy by rolling out some No Fail Sugar Cookie Dough and whipping up some darling button shaped cookies with our new Stainless Steel Button Cookie Cutter. These buttons look sew cute with brightly colored dough. See our how-to recipe HERE. Also NEW are fabulous button shaped candy molds in assorted styles perfect for a spring tea. 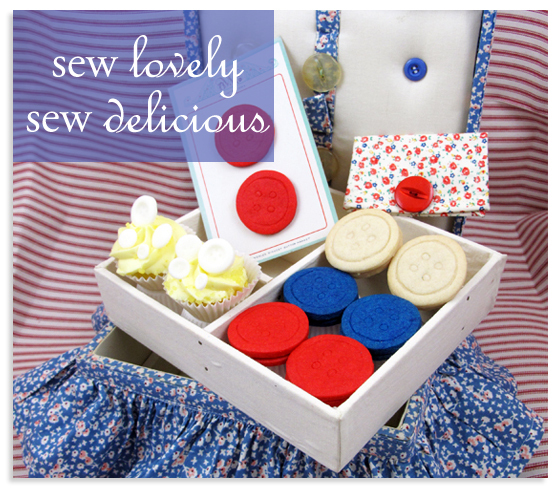 Package your darling cookie shapes in the cute and colorful Nana’s Sewing Box in blue. Also available in a bright red pattern. This entry was posted in Cookie Recipes & Ideas and tagged button cookies, cookie decorating, fancy flours, fancyflours, mother, sewing, sewing basket, sewing cookies by Fancy Flours. Bookmark the permalink. These are nice, I really like the red ones! !